When it comes to traveling home for the holidays, a properly packed travel bag is an essential. I live for an excuse to jet out of town on spontaneous trips and I always look forward to traveling home for the holidays. There's a fine line between under packing and over packing; one will undoubtedly leave you with sore shoulders and the other has the potential to lead to several fashion misfortunes. After dozens of 6 hour plane rides and 4 hour car drives from the west coast to the east coast over the years, I've finally figured out the formula for the perfectly packed travel bag and this super cute Miss Me style tote perfectly fits all of my travel essentials. Headphones - For blaring my new favorite Christmas CD, Kelly Clarkson's Wrapped in Red! Laptop - Work never stops for me. Where there is wifi, there is work, so I always keep my laptop on hand while traveling. iPad and adorable cover - I mainly use my iPad for browsing my favorite sites and doing a lot of Pinterest pinning. It's more discrete and easier to manage than my laptop, so it makes for the perfect in-flight companion. Hand sanitizer - As a self proclaimed germ-freak, hand sanitizer is a necessary safety precaution when it comes to hours of various transportation. iPhone and adorable case - It's no secret that a phone is an essential on everyone's list these days, but even more important, is remembering to pack your phone charger in your carryon bag and not your checked luggage. No one wants to be stranded with a dead phone. Snacks and protein bars - As a vegetarian, I often find myself starving with little to no food options, so I always try to keep some snacks and protein bars on hand while traveling. Passport - It's always a good idea to keep extra identification on hand to avoid getting stranded. Gum - For fresh breath and to keep my ears from popping when flying. Blanket Scarf - It only took me one freezing cold overnight flight to never board a plane without an oversized scarf that can double as a blanket if needed. Lip balm - When traveling from different climates my skin and lips start to dry out, so I always try to keep some lip balm on hand. Vitamin and electrolytes drink mix - I always drink one of these before I board the plane for a little extra defense against all of the germs floating around the airport and plane. Water bottle - It's essential to stay hydrated when you're traveling. Dehydration can exaggerate jetlag, so be sure to drink lots of water and avoid a lot of caffeine, which can increase your travel stress. Notebook and pencil - I love making lists: Christmas gift lists, shopping lists and, of course, work lists, so I try to keep pencils and paper on hand for a little old-school notes. This post is brought to you by Miss Me. All opinions are my own. For more Miss Me fashion be sure to follow them on Facebook, Twitter, Instagram, Pinterest and Google+. Great post and I love your outfit! Great look! I love that coat. love your coat! i have more or less the same! Nice post! Like so much the coat. This is pretty much everything what I bring with me when travelling! Hand sanitizer, headphones, all electronic gadgets, passport, water and gums... They're just a must have for me! Great summary of all the necessities a girl must have. …and your coat looks beautiful! I lobe your style, always perfect. Love this look! The skirt and coat are pretty! You look stunning, love! I LOVE that tail mix! YUM! i love the Miss Me bag and that coat. Great post! That coat is too much for my heart! Such a great coat. I always love these type of post. I never go on a flight without a ton of magazines. oooo, I love the detail on the skirt. Subtle but fab. thanks so much for this...the hubs an I are actually traveling quite a bit this upcoming christmas, so this is much appreciated! Love, love, love Be Kind bars! I love your jacket and that mustard top! That bag is adorable too! You always look so cute and pulled together Anna. 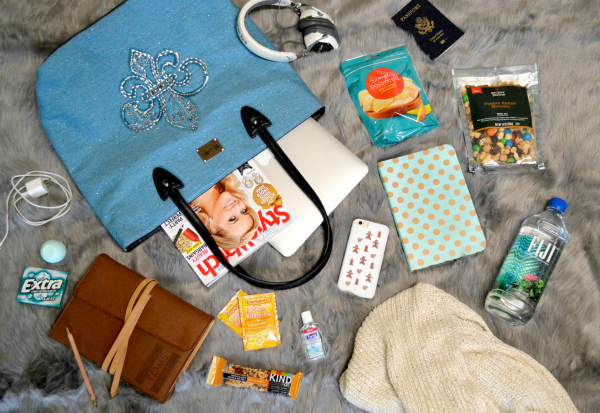 Loving all of your travel essentials too by the way! P.S. I've been following your blog for years now but this is the first time I've commented. I probably shouldn't admit that (blasphemous!) but I promise you can expect to see more of these from now on! I absolutely love this jacket. Love your blog! OMG. That coat is everything! Obsessed with that jacket!! It's so cute. That coat is really pure love!